Cropped scan of back cover of Penguin No.735 (unattributed image). Phyllis Eleanor Bentley was born in the West Riding of Yorkshire, England, the daughter of a mill owner. She attended Halifax High School for Girls, Cheltenham Ladies' College, and London University. 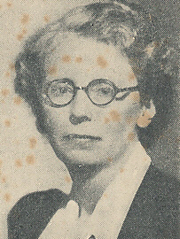 During World War I, she taught in a boys' school and worked for the Ministry of Munitions in London. After the war, she returned to Halifax and taught English and Latin at a grammar school. In 1918, she published her first work, The World's Bane, a collection of short stories. Her first novel was The Partnership (1928). Her best-known work, the critically-acclaimed novel Inheritance (1932) was set during the development of the textile industry in her native Yorkshire. With two subsequent novels published in 1946 and 1966, it formed a trilogy, which was adapted as a popular 1967 British television film that made her famous. She published six historical novels for children, including Gold Pieces (1968). She also wrote 24 detective short stories, featuring Miss Marian Phipps, beginning with "The Missing Character" in 1937. A member of the Council of the Brontë Society, she wrote several biographies of the Brontë family. She was elected a Fellow of the Royal Society of Literature, and was awarded an OBE in 1970. Phyllis Bentley is currently considered a "single author." If one or more works are by a distinct, homonymous authors, go ahead and split the author. Phyllis Bentley is composed of 5 names. You can examine and separate out names.